20th Century FoxA scene from the movie ‘The Martian,’ which is based on a fictional yet realistic outpost on planet Mars. 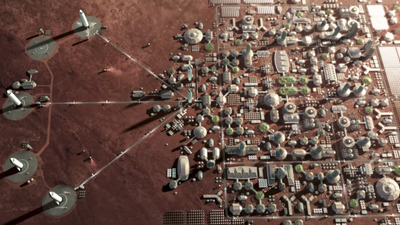 The movie depicts a temporary Mars outpost with pre-delivered supplies and habitats. But Elon Musk, the founder of SpaceX, rallies his rocket company around the idea of colonizing Mars. Building a self-sustaining city on the red planet is a far greater challenge than a stay of a year or two. In the 2015 blockbuster sci-fi movie “The Martian,” astronaut Mark Watney lands on Mars with five other intrepid explorers in the not-so-distant future. Their Ares III mission is one of several human landings on the red planet, and the crew arrives at a pre-assembled outpost, complete with enough food, water, and air to last them about a month. There are also tube-shaped rovers on the ground and a nuclear-powered mothership in orbit. There’s good amount of fiction in the movie (as well as the book it was adapted from), but fans and scientists alike hailed the concept as delightfully realistic – and maybe even inevitable. “The scenario in ‘The Martian’ is completely doable,” D. Marshall Porterfield, the former director of NASA’s Space Life and Physical Sciences Division, previously told Business Insider. However, Porterfield and other researchers have a lot of questions for Elon Musk, the billionaire founder of SpaceX, about his ambitious long-term plans for sending people to Mars. SpaceX/YouTubeReusable BFR spaceships might enable SpaceX to colonize Mars. Musk has gone further in interviews and talks, saying it’s crucial that we try to colonize Mars in case something goes seriously wrong on Earth. 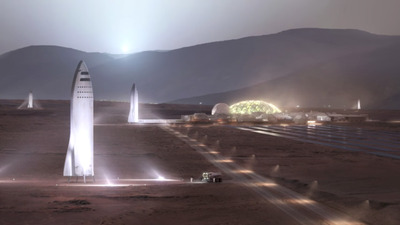 During a 2016 presentation, for example, Musk said it’s possible to put 1 million people on Mars within 100 years of SpaceX’s first launch to the red planet. He envisions the company’s Big Falcon Rocket – a nearly 35-story launch system that includes a 16-story spaceship – as the primary tool to get the job done. Musk’s “aspirational” timeline is to launch an uncrewed BFR mission to Mars in 2022, followed by a crewed mission in 2024. BFR is being designed to be fully reusable, which would make it inexpensive to launch, land, and refuel. (Nearly all rockets today are discarded after one use.) SpaceX re-used a rocket booster with its Falcon 9 system for the first time in March 2017. SpaceX/YouTubeElon Musk’s vision of a self-sustaining city on Mars. Musk has mentioned the potential to use domed greenhouses to grow food on the red planet and water shielding to fight against radiation. But he has not elaborated much on his plans to sustain the first explorers, who are due to land on Mars in less than a decade, based on his timeline. Building a city of 1 million on a cold, arid, and perhaps lifeless planet 158 million miles from Earth is, of course, an even more far-fetched goal. 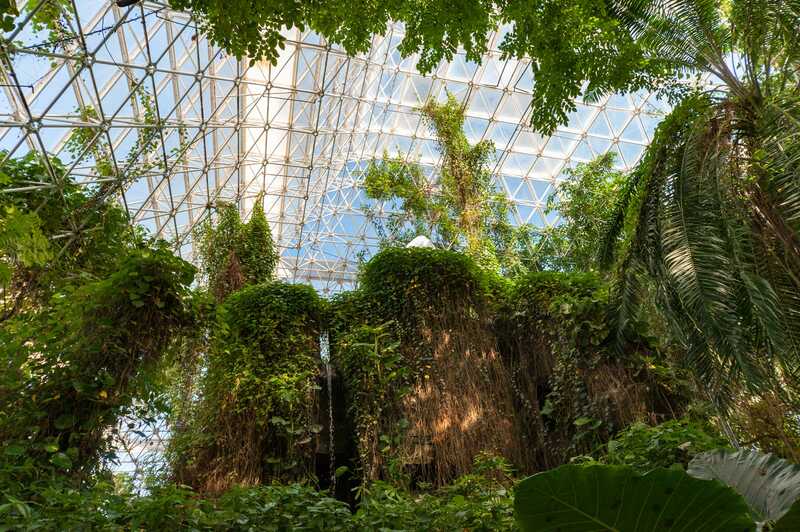 Dave Mosher/Business InsiderBiosphere 2’s rainforest biome features steep, foliage-covered cliffs and a waterfall. “His idea about colonizing? That’s going to require … bioregenerative life support capabilities,” Porterfield said. 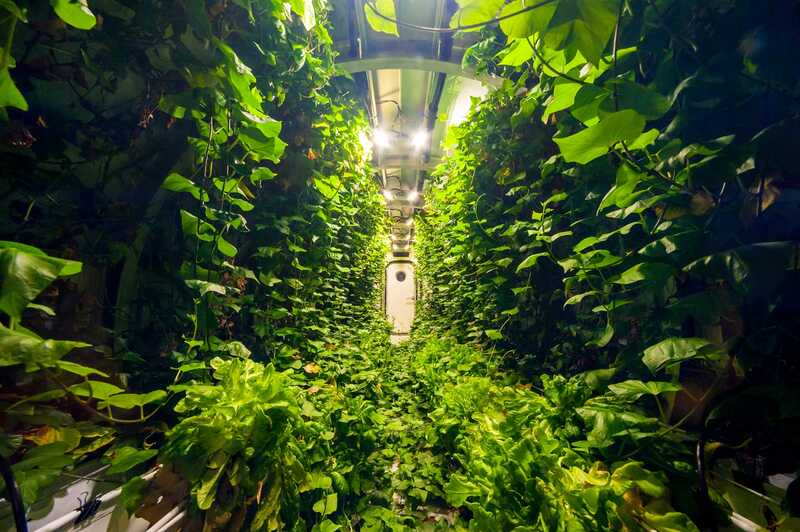 The idea behind bioregenerative life support, which Porterfield worked on at NASA, is to collect a human crew’s breath, liquid waste, and solid waste – then use plants and other life forms to recycle it into fresh food, water, and air. This would dramatically reduce the need for resupply missions and help ensure a crew’s long-term survival. It would also make a colony vastly more sustainable, affordable, and independent. Mars simulation experiments like Biosphere 2 in the 1990s explored the space-colonization concept on grand scales, but encountered significant problems (including a large loss of oxygen). Dave Mosher/Business InsiderBiosphere 2’s rainforest biome. Specialised greenhouse habitats might enable bioregenerative life support systems to work on smaller scales. However, NASA’s research in that area was mostly de-funded after 2000. “NASA basically gutted the entire future of spaceflight exploration in order to finish building the space station, and we really haven’t fully invested in supporting the sciences required to use the space station today so that we can be competitive,” Porterfield said. He added that China is poised to overtake the US in bioregeneration with its “Lunar Palace-1” experiment. In July 2017, four students locked themselves inside that structure’s airtight confines and subsisted on plants and mealworms for 200 days. Perhaps a million people now work for China’s space agency, some experts estimate.